Monoclonal IgG antibodies can be labelled with positron emitting radionuclides, enabling highly specific imaging of tissue antigen expression in vivo. However, the nonspecifically bound antibodies stay in the body for a long time, and it may take days before PET scan with good image contrast can be obtained. Isotopes with long half-lives, such as 89Zr or 124I, has to be used, which leads to high radiation dose to the subjects. Pretargeted PET imaging enables PET scanning in only few hours after radiotracer injection; isotopes with shorter half-lives, such as 18F and 68Ga, can therefore be used, reducing the radiation dose. Aptamer oligonucleotides or peptides are smaller and easier to produce than antibodies, and are therefore often used as alternatives to antibodies. Radioimmunotherapy (RIT) is targeted radiotherapy where irradiation from radionuclides is delivered to tumours using monoclonal antibodies. RIT is well suited for treating leukaemia, because the cancer cells are easily accessible by the circulating labelled antibodies. Distribution kinetics of an antibody aimed for RIT can first be studied with PET imaging, and if results are promising, the positron-emitting label can be replaced with a radionuclide suitable for radiotherapy. Beta-emitters (including 90Y, 131I, 177Lu, and 67Cu) are best suited for treating tumours that are at least a few mm in size, while alpha-emitters (including 211At and 213Bi) can be used to kill isolated cancer cells. Biologic therapeutic agents are manufactured in living systems, usually with recombinant DNA technology, for instance recombinant human insulin and monoclonal antibodies. Biosimilars are highly similar but not identical to their reference biological products, and do not require full efficacy and safety testing, if the reference biologic product is previously approved for medicinal use. The transport rate of antibodies into tissue interstitial space is dependent on the paracellular pores in the vascular endothelium and the rate of fluid movement from blood to tissue. Typical IgG transfer rates are in the range 0.07-0.13 h-1 (Eger et al., 1987). Antibodies do not diffuse across membranes because of their hydrophilicity and large size (200-300 nm), but need active or passive transport. Concentrations of administered monoclonal antibodies (mAbs) in the central nervous system are usually very low, except if the blood-brain barrier is compromised by inflammation. Instead, in liver, spleen and bone marrow, and in most tumours, the antibody concentrations (both specific and nonspecific uptake) are usually higher because of discontinuous (“leaky”) endothelium. Endothelial and epithelial cells may contain transporters that enable active transport of specific immunoglobulin types, especially in mucosal tissues. Cell-penetrating peptides can be attached to mAbs to aid in transport across plasma membrane. Masses of mAbs used in treatments can easily saturate the specific binding compartment, and dose-dependent alterations in biodistribution have been reported. If the affinity of mAb to its antigen is very high, endothelial passage becomes the limiting factor for tissue uptake. Interstitial space contains negatively charged groups such as heparin sulphate proteoglycans within extracellular matrix and glycan chains on cell surfaces. Antibodies are cleared from the tissue mainly via lymphatic system, because the lymphatic capillaries are more fenestrated than the vascular capillaries; however in tumours the lymphatic flow may be very low. Lymph flow is an important component of pharmacokinetic models for mAbs (Eigenmann et al., 2017a and 2017b). Fc region of antibody molecules translate information on the binding status of the antibody to the adaptive and innate immune system via Fc receptors, Fc receptors have an important role in protecting IgG from intracellular catabolism, especially FcRn, that is located in the vascular endothelium and epithelium of gastric system, kidneys, and lungs. When IgG and other proteins enter cells via endocytosis, FcRn recycles IgG into the plasma or interstitial space. The role of FcγR, located in the antigen presenting cells, on IgG distribution is less clear (Glassman et al., 2015). Glycosylation of Fc region and Fc receptors is critical for the structural integrity and function. Intracellular catabolism is the main route for IgG elimination; IgG secretion into urine and bile is low. Normal IgG antibodies have a long plasma halflife of about 3 weeks, and are mainly catabolized by the reticuloendothelial system. Most labelling methods rely on reactions between amino acid residues of the mAb or antibody fragment and bifunctional molecule that also contains a chelators binding the isotope. For example, 89Zr chelator DFO-NCS is conjugated randomly to lysine residues, including the antigen binding domain. This leads to products that have different number of chelators at different positions; these regioisomers have variable chemical and pharmacological properties (Adumeau et al., 2016). Therefore site-specific bioconjugation methods have been developed, and have show to provide better in vivo pharmacokinetics and target-to-background ratios (Adumeau et al., 2016a, 2016b, and 2018). Relatively low tissue-to-blood ratio of labelled mAbs affects PET image quality and must be accounted for in quantification. PET data analysis methods often assume that dynamic equilibrium between free radiopharmaceutical in tissue and plasma is reached during the scan; due to the slow endothelial passage and clearance via lymphatic system this assumption may not be valid for labelled mAbs. Antibody is usually administered in relatively high amount as compared to the antigen concentration. Because of the saturation of binding sites, compartmental models can only be described using non-linear differential equations (Strand et al., 1993). Antibody fragments (Fabs) can be produced from intact immunoglobulins via enzymatic process, for example with pepsin, which cleaves out most of the IgG but leaves the F(ab’)2 fragment intact. Antibody fragments typically have faster tissue uptake and shorter plasma halflife than the intact IgGs. Absence of the Fc region protects from immunological reactions. Faster clearance from circulation is caused by faster extravasation and excretion to urine, since antibody fragments are small enough to pass through the glomerular filtration barrier of the kidneys. Therefore marked renal uptake and accumulation in urine bladder may be observed. Single-domain antibody fragments (sdAbs) targeted against macrophage mannose receptor (MMR, CD206) can be used for imaging macrophages and dendritic cells, and labelled with 18F (Blykers et al., 2015). Affibodies are engineered peptides containing a high affinity binding part in a non-antibody scaffold (Tolmachev et al., 2012). Like antibody fragments, affibodies are much smaller (∼7 kDa) than antibodies and therefore have faster tissue uptake and clearance, and are faster to produce with excellent purity. Kinetics may still be too slow to use 68Ga as the label, but 64Cu has suitable half-life. CB-TE2A is one of the best chelators for labelling of peptides with 64Cu (Cai & Anderson, 2014); the high temperature needed for attaching the chelator changes the tertiary structure of peptides, but small affibodies refold rapidly under physiological conditions (Arora et al., 2004). Pretargeted PET imaging may be feasible with affibodies (Altai et al., 2016 and 2017). mAbs binding to epidermal growth factor receptor (EGRF, HER1), including cetuximab, have been labelled with 89Zr. While RGFR-bearing tumours can be visualized, and high uptake may predict good treatment response, uptake may still not correlate well with the EGFR expression (Bahce et al., 2017). Cetuximab has been used in pre-targeted PET imaging, using 68Ga and 18F as the radionuclide (Evans et al., 2014; Keinänen et al., 2017). Cetuximab binds to the extracellular domain of EGFR, and is then slowly internalized. Erlotinib is a small molecule drug that acts in EGFR, inhibiting tyrosine kinase, and it has been labelled with 11C. Cheng et al. (2016) have labelled EGFR affibody with 11C. Radioimmunotherapy using anti-EGFR mAbs is being used in patient trials, for example in bladder cancer. Vascular endothelial growth factor (VEGF) and its receptor (VEGFR) are markers of angiogenesis, and upregulated in many cancer types. VEGF-A targeting bevacizumab has been labelled with 89Zr and used in numerous imaging studies. Despite VEGF-A being a soluble ligand, increased [89Zr]bevacizumab uptake has been seen in tumours (Bahce et al., 2017). Epidermal growth factor receptor 2 (HER2) is overexpressed in many cancer types, including breast cancer. Trastuzumab is a humanized IgG1 mAb that binds to HER2; it has been labelled with 64Cu and 89Zr. In pre-targeted imaging, trastuzumab can be labelled in vivo with [18F]tetrazine (Keinänen et al., 2017). Trastuzumab has slow pharmacokinetics, and when bound to HER2, it is slowly internalized. CD20 is an activated-glycosylated phosphoprotein on the plasma membrane of B lymphocytes in most of its developmental phases. It is expressed on most lymphoma cells, and therefore used as a target in radioimmunotherapy (RIT). Rituximab is a chimeric mAb against CD20, that reduces the number of active inflammatory lesions and relapses in MS patients. Rituximab has been labeled with 89Zr and 124I. [89Zr]rituximab does not penetrate blood-brain barrier (BBB), even in CD20-positive lesions in patients with relapse-remitting MS, where BBB is disrupted; brain tissue concentrations correspond to the blood volume fraction (Hagens et al., 2017). Carbohydrate antigen 19.9 (Sialyl Lewis A antigen) is a common tumour associated antigen. As a serum biomarker it has partially failed because it is secreted also in benign pathologies. Monoclonal antibodies targeted specifically to the sites of CA19.9 secretion can still be useful for detection and radioimmunotherapy of certain cancers, such as pancreatic ductal adenocarcinoma and urothelial bladder cancer (Viola-Villegas et al., 2013; Escorcia et al., 2018). Due to the slow tissue penetration of mAbs, whole-body static imaging is performed few days after administration. Simplified uptake parameters, including SUV and tissue-to-reference tissue or tissue-to-blood ratio can be calculated from static scans (Bahce et al., 2017). Differences in vascular permeability and interstitial pressure may affect the uptake; permeability mainly affects the time required for the interstitial space to come to equilibrium with the plasma, while convection (in practise the lymph flow rate) may be the main driver of transcapillary exchange of mAbs and F(ab’)2 fragments (Baxter et al., 1994). The leaky vascular endothelium in tumours reduces or even reverses the pressure gradient leading to slow and heterogeneous uptake of macromolecules Jain, 1990). If labelled mAb is internalized into target cells, then 76Br, 124I, and some other radionuclides are rapidly cleared from the cells, reducing target-to-background ratio, while certain other radionuclides, including 89Zr, 64Cu, and 86Y are trapped in the cells. Analysis of the kinetics of labelled mAbs in tissue requires nonlinear models that take into account the saturation effects because of the high-affinity antibody-antigen binding (O’Donoghue et al., 2011) and usually low specific activity. This affects also the pharmacokinetic and pharmacodynamic modelling of antibodies (Strand et al., 1993; Dostalek et al., 2013). Low specific activity of labelled mAbs is deliberate, to overcome the high nonspecific binding of antibodies, especially in the liver, blood, and bone marrow. As usual, concentration of the radioligand, in this case labelled antibody [Ab], is not constant but can be measured. Concentration of free antigen, [Ag], is not constant, either, and therefore the change in the concentration of antibody-antigen complex, [AbAg], is dependent on two time-varying concentrations. These models are similar to the radioligand-receptor binding models, including the association (kon) and dissociation (koff) rate constants. Cheal et al. (2014) have used a nonlinear two-tissue compartmental model to analyse mice studies with internalized PET radiopharmaceuticals. Internalization is usually slow, leading to two kinetically different compartments for specific binding (extra- and intracellular). The tissue uptake of mAbs, antibody fragments, and affibodies is affected also by other factors than the concentration of the specific target. Specific uptake should be determined by conduction the study with two radioligands, otherwise similar, but one with and one without specific binding to the target. For example, 11C-labelled EGFR affibody uptake in mice tumour model did not correlate with the EGFR expression, and non-specific affibody uptake was in some cases equally high as the uptake of the specific affibody (Cheng et al., 2016). Aluicio-Sarduy E, Ellison PA, Barnhart TE, Cai W, Nickles RJ, Engle JW. PET radiometals for antibody labeling. 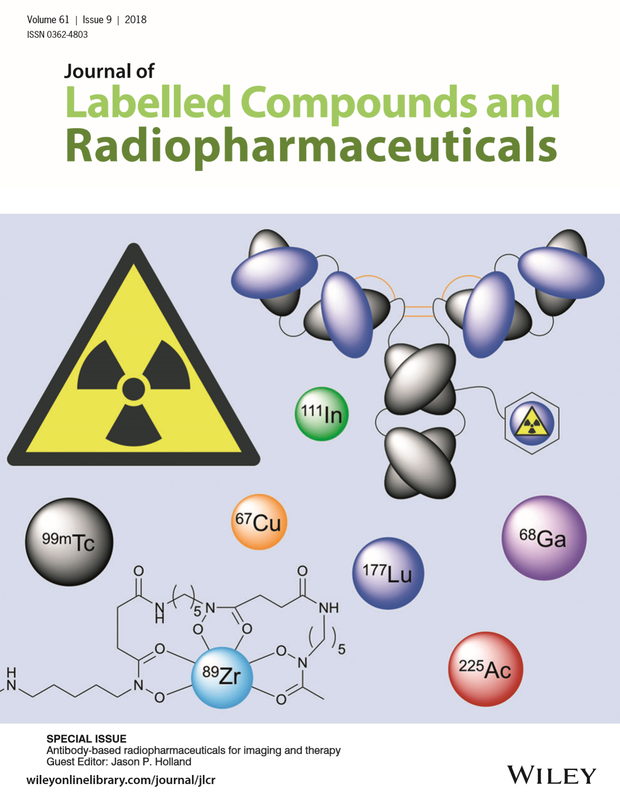 J Labelled Comp Radiopharm. 2018; 61(9): 636-651. doi: 10.1002/jlcr.3607. Boswell CA, Brechbiel MW. Development of radioimmunotherapeutic and diagnostic antibodies: an inside-out view. Nucl Med Biol. 2007; 34(7): 757-778. doi: 10.1016/j.nucmedbio.2007.04.001. Boswell CA, Bumbaca D, Fielder PJ, Khawli LA. Compartmental tissue distribution of antibody therapeutics: experimental approaches and interpretations. AAPS J. 2012; 14(3): 612-618. Cheal SM, Punzalan B, Doran MG, Evans MJ, Orborne JR, Lewis JS, Zanzonico P, Larson SM. Pairwise comparison of 89Zr- and 124I-labeled cG250 based on positron emission tomography imaging and nonlinear immunokinetic modeling: in vivo carbonic anhydrase IX receptor binding and internalization in mouse xenografts of clear-cell renal cell carcinoma. Eur J Nucl Med Mol Imaging 2014; 41: 985-994. doi: 10.1007/s00259-013-2679-1. Dostalek M, Gardner I, Gurbaxani BM, Rose RH, Chetty M. Pharmacokinetics, pharmacodynamics and physiologically-based pharmacokinetic modelling of monoclonal antibodies. Clin Pharmacokinet. 2013; 52(2): 83-124. doi: 10.1007/s40262-012-0027-4. Freise AC, Wu AM. In vivo imaging with antibodies and engineered fragments. Mol Immunol. 2015; 67(2 Pt A): 142-152. doi: 10.1016/j.molimm.2015.04.001. Glassman PM, Abuqayyas L, Balthasar JP. Assessments of antibody biodistribution. J Clin Pharmacol. 2015; 55(S3): S29-S38. doi: 10.1002/jcph.365. Goldsmith SJ. Receptor imaging: competitive or complimentary to antibody imaging? Semin Nucl Med. 1997; 27(2): 85-93. Goodwin DA. Pharmacokinetics and antibodies. J Nucl Med. 1987; 28(8): 1358-1362. Iwasaki A. Immune regulation of antibody access to neuronal tissues. Trends Mol Med. 2017; 23(3): 227-245. Kairemo KJ. Positron emission tomography of monoclonal antibodies. Acta Oncol. 1993; 32(7-8): 825-830. doi: 10.3109/02841869309096142. Keizer RJ, Huitema AD, Schellens JH, Beijnen JH. Clinical pharmacokinetics of therapeutic monoclonal antibodies. Clin Pharmacokinet. 2010; 49(8): 493-507. Knowles SM, Wu AM. Advances in immuno-positron emission tomography: antibodies for molecular imaging in oncology. J Clin Oncol. 2012; 30(31): 3884-3892. doi: 10.1200/JCO.2012.42.4887. Mayer AT, Gambhir SS. The immunoimaging toolbox. J Nucl Med. 2018; 59(8): 1174-1182. doi: 10.2967/jnumed.116.185967. Mould DR, Green B. Pharmacokinetics and pharmacodynamics of monoclonal antibodies: concepts and lessons for drug development. BioDrugs 2010; 24(1): 23-39. O’Donoghue JA, Smith-Jones PM, Humm JL, Ruan S, Pryma DA, Jungbluth AA, Divgi CR, Carrasquillo JA, Pandit-Taskar N, Fong Y, Strong VE, Kemeny NE, Old LJ, Larson SM. 124I-huA33 antibody uptake is driven by A33 antigen concentration in tissues from colorectal cancer patients imaged by immuno-PET. J Nucl Med. 2011; 52(12): 1878-1885. doi: 10.2967/jnumed.111.095596. Peters C, Brown S. Antibody-drug conjugates as novel anti-cancer chemotherapeutics. Biosci Rep. 2015; 35(4): e00225. Reddy S, Robinson MK. Immuno-positron emission tomography in cancer models. Semin Nucl Med. 2010; 40(3): 182-189. Strand SE, Zanzonico P, Johnson TK. Pharmacokinetic modeling. Med Phys. 1993; 20(2 Pt 2): 515-527. doi: 10.1118/1.597047. Tichauer KM, Wang Y, Pogue BW, Liu JTC. Quantitative in vivo cell-surface receptor imaging in oncology: kinetic modeling and paired-agent principles from nuclear medicine and optical imaging. Phys Med Biol. 2015; 60: R239-R269. Van Dongen GA, Huisman MC, Boellaard R, Harry Hendrikse N, Windhorst AD, Visser GW, Molthoff CF, Vugts DJ. 89Zr-immuno-PET for imaging of long circulating drugs and disease targets: why, how and when to be applied? Q J Nucl Med Mol Imaging. 2015; 59(1): 18-38. Vugts DJ, Visser GW, van Dongen GA. 89Zr-PET radiochemistry in the development and application of therapeutic monoclonal antibodies and other biologicals. Curr Top Med Chem. 2013; 13(4): 446-457. Wang W, Wang EQ, Balthasar JP. Monoclonal antibody pharmacokinetics and pharmacodynamics. Clin Pharmacol Ther. 2008; 84(5): 548-558. doi: 10.1038/clpt.2008.170. Wilks MQ, Knowles SM, Wu AM, Huang SC. Improved modeling of in vivo kinetics of slowly diffusing radiotracers for tumor imaging. J Nucl Med. 2014; 55(9): 1539-1544. doi: 10.2967/jnumed.114.140038. Wu AM. Engineered antibodies for molecular imaging of cancer. Methods 2014; 65(1): 139-147. Zanzonico P, Carrasquillo JA, Pandit-Taskar N, O’Donoghue JA, Humm JL, Smith-Jones P, Ruan S, Divgi C, Scott AM, Kemeny NE, Fong Y, Wong D, Scheinberg D, Ritter G, Jungbluth A, Old LJ, Larson SM. PET-based compartmental modeling of 124I-A33 antibody: quantitative characterization of patient-specific tumor targeting in colorectal cancer. Eur J Nucl Med Mol Imaging 2015; 42(11): 1700-1706. Zhao J, Cao Y, Jusko WJ. Across-species scaling of monoclonal antibody pharmacokinetics using a minimal PBPK model. Pharm Res. 2015; 32: 3269-3281.